Much is said about the Blue City of India and in all fairness, the city deserves more. The people of Jodhpur are warm and help you with not just directions but offer to lead the way too. 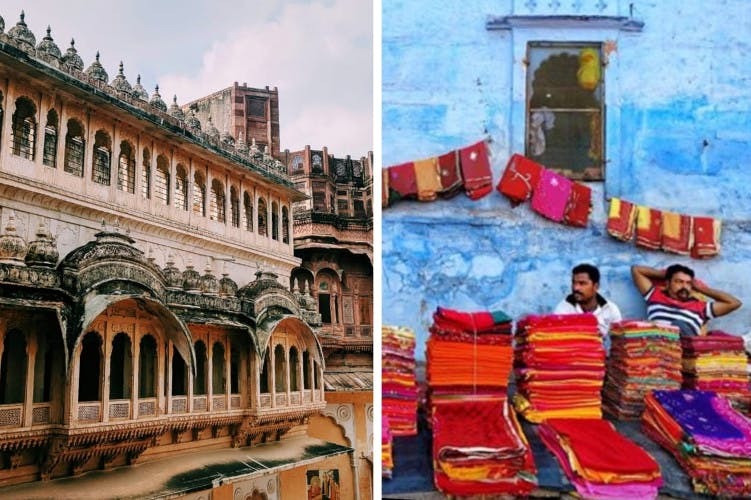 If you are visiting Jodhpur for the first time, you can pretty much explore the city in a day. Want to know how? Let's dive in! The locals love their chai and usually begin their day with it. And we did the same too. Popular votes led us to Bhati Tea Stall, which usually is crowded from 6.30am. Ask for a cup of Masala Chai and Bread Pakoda, and you'll be handed those in no time. Sweet and milky chai and crisp pakoda are good enough to prep you for the day. Mehrangarh is a must-do when you're in Jodhpur. Regarded as one of the largest forts in India, you've got to check out this fort for its architecture. The museum inside has a vast display of palanquins, coins, armours, howdahs, and paintings. The view of the city keeps getting better as you climb each floor, and we recommend spending a few minutes at the entrance of the fort where local musicians sing and play local tunes. You'll find cafes and souvenir shops inside the fort and while a few are overpriced, we loved our time at Cafe Mehran. Located inside the city, this stepwell is where local youth go for a swim. It is surrounded by lovely cafes like The Stepwell Cafe and Namaste Cafe that also offer the view of Mehrangarh. Plus, there are plenty of boutiques for you to explore. Spend a while at the stepwell and head out to a cafe. Do note that the surroundings of the stepwell aren't so clean. If you're looking for a hearty meal in Jodhpur, don't you go beyond Gypsy. Known for its king-sized thalis that come with authentic delicacies like dal bati churma, kadhi, get a scoop of Rajasthan here. The restaurant is always crammed, so eat and go has to be your mantra. The Blue City doesn't have sprawling blue houses everywhere and you literally have to hunt for them. Behind the Mehrangarh Fort, there is an area called Brahmapuri where you'll find the most number of blue houses. If you've got the patience to walk for 30-40 minutes, you'll cover most of the blue houses and we're telling you, the architecture is brilliant. Don't forget to wear a bright outfit to jazz up your Instagram. Want some ghewar, malpua, and namkeen? Then Janta Sweet Home will offer you the best. We got ourselves some samosa, pyaaz kachori, khaman khandvi and loved them to bits. Towards the end, we grabbed lassi, mawa kachori for that perfect sweet finish. Be sure to get bottles of Sangri Ka Achar and Ker Ka Achar on your way out. Everything comes really well packed and you can carry them on your flight too. This 56-year-old restaurant serves the best dal batti churma in the city and you can relish plates of it without going broke. Yup, it's a basic inexpensive restaurant but a must-visit when you're in Jodhpur. The markets around the clock tower (Or Ghanta Ghar as the people fondly call) are a haven if you are looking for budget fashion wear or street food. Right from breakfast stalls whipping poha to street vendors selling bright palazzo pants, maxi skirts, and Boho jewellery, get them all here. Pal Haveli is a luxury hotel located near the markets of Ghanta Ghar. A dinner at its in-house restaurant, Indique, is a must-do as it offers the view of Mehrangarh Fort, Ghanta Ghar, Gulab Sagar lake. The rooftop seating area has candles lit on every table and you can dine under the stars with a view to kill for. We recommend making a reservation to grab the best spot in the restaurant. The food, although, isn't the greatest you should try the laal maas, gatte ki sabji. Do note that the hotel has no parking or valet parking and you might have to park your vehicle on the street. Navigating the city through Google Maps can be tricky as the maps are really tangled here. If you think you're lost for directions, seek help from the wonderful people of Jodhpur and they'll direct you to your destination.